The first fiction book published by Puffin, Worzel Gummidge, in 1941 doesn’t make the cut 70 years later, but there is a good sprinkling of other classics among the 70 featured titles, which are organised in categories ranging from Best Swashbucklers and Derring-do and Best Blood and Guts to Best Weird and Wonderful and Best Weepies. Watership Down heads up the latter category while both Dracula and The Hound of the Baskervilles feature in the blood and guts section. Alice in Wonderland and Anne Frank’s Diary of a Young Girl are also on the list. Roald Dahl is honoured with a section of his own – Best Phizzwhizzers – containing The BFG, Matilda, Charlie and the Chocolate Factory and Fantastic Mr Fox. 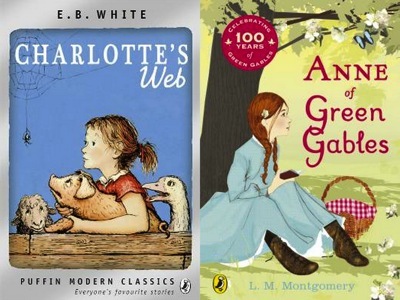 It’s surprising that Puffin has published so many of the all time classic books in children’s literature like Anne of Green Gables, Charlotte’s Web, and Charlie and the Chocolate Factory. That’s quite a track record. The Best BEST BEST BEST!